When Richmond Park was a deer park for the king, Ham House was the very height of Restoration chic, and one of the centres of courtly life – this is around 1670 we're talking. It's unusual that the building has survived in pretty much its original state, but it's not changed much since the stately vision of it was conceived by the Countess of Dysart, one of the key figures in the English Civil War and a staunch conspirator on the side of Charles II. A brief history of Ham House: Built in 1610, the house passed to William Murray, the 1st Earl of Dysart, in 1626, who'd been the 'whipping boy' for Charles I – he literally took the young prince's punishments. Murray was the one who collected much of the art on the walls today, he shared Charles' artistic tastes. On Murray's death his title and house passed to his daughter Elizabeth, who became the Countess of Dysart and known for her involvement in the political intrigues surrounding Charles II and for her taste for opulence. This is the era when wealth was pouring most freely into the house and the last great refurbishments and most valuable treasures were instated. After that most of the work done on the house were repairs – and adding some mod cons so that it could be lived in up until 1948, when it was given to the National Trust. In practical terms that makes Ham House one of the best kept and most authentic great Stuart houses, and for visitors an opportunity to see first hand how the court of this period lived. And the upper echelons of society certainly lived well – not much appears to have been spared at Ham when it came to creating an appearance of great formal grandeur. This house has definitely been designed to impress, complete with grand staircases, long, wood panelled corridors lined with artworks and plush fabrics, carpets and furnishings, which are even more impressive when you remember that they were all made by craftsmen not at the Habitat factory. The garden isn't just one of the few formal gardens surviving from this period, it's also historic and photogenic, especially the cherry garden and the south terrace planted with yew and pomegranate. There's a maze and an Orangery, and a brick ice house and a still, and lavender lined paths leading up to a statue of Bacchus, who Charles II was supposed to remind people a little of. If the day is too nice to spend indoors there's a reduced ticket price that just lets you into the garden where you're welcome to bring a picnic. 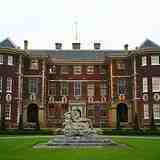 It's said, on the Ham House tour, that the Countess haunts the grounds of what she considered HER great house. But the Dysart name lives on more tangibly in the form an excellent pub, a short, and very pleasant, walk through Richmond Park from Ham House. The food is reliably good, despite frequent menu changes. Why? It's as close to a trip back in time to the Restoration as you can get. When: House open 12 – 4 Mon, Tues, Wed, Sat, Sun between the 13th of Feb and the 31st of October with limited Christmas opening.